Dark Souls is a series that has come to be renowned worldwide. The From Software trilogy began with the critically acclaimed Dark Souls in 2011 and ended in 2017 with The Ringed City DLC for Dark Souls 3 in 2017. It is a dark and bleak RPG in which you traverse across dying worlds devoid of life and hope. Your character is faced with insurmountable odds, as you try to overcome giant monsters and crazed warriors alone. On this episode of Sound Test, we delve into the music of the trilogy as well as Bloodborne, the 2015 From Software title that came between Dark Souls II and Dark Souls III. I will be covering the trilogy while Robert tackles Bloodborne. It is composed in a very similar manner by the same group of people and definitely fits in the discussion with them. Be warned, here there be spoilers for the trilogy primarily! Motoi Sakuraba is the primary writer for the first two games and split the role with several others for Dark Souls III. He has done a lot of video game soundtracks over the years, but his most known bodies of work are probably the Tales of JRPG series and the Phantasy Star series. He has also assisted with a number of Nintendo games including the Mario Tennis and Super Smash Bros. soundtracks. He likes to work alone, and doesn’t communicate much with other sound designers except for to give them his completed tracks. The soundtrack for the trilogy is composed of choral compositions that have a very diverse stylistic approach, but touch on a lot of baroque notes more than any other. There is a lot of choral vocal usage throughout the boss themes especially. Eerie, soaring vocals accompany brooding keys and shrill strings to create chaotic and urgent compositions that increase the stress of the fights tenfold. It’s frightening enough to be getting mercilessly wrecked by Ornstein and Smough simultaneously, and their theme makes it way more intense. The sound design of the first Dark Souls is very well utilized. It is full of incredibly memorable sound effects and music tracks that are implemented perfectly. From Software saves Motoi Sakuraba’s works for the grand moments of the game, like when the Gaping Dragon comes lumbering towards you for the first time and the frenetic strings suddenly pick up. The music is also used in hub areas, the only time in the game where you have a moment of safety and reprieve from the cruel world of Lordran. When you first wander through Firelink Shrine, the main hub of Dark Souls, the music seems so bleak. But when you wander the world and it’s quiet aside from the shrieks of your enemies and your own repeated death throes, reentering Firelink and hearing those opening chords suddenly becomes the most magical sound in the world. This place might be disheveled and dying, but there is also a warmth to it. You are safe again, for now. Pretty much every boss theme in this game is great and unique. They all seem to suit their respective boss and sound amazing when you’re in the midst of an epic battle. The overworld being so quiet makes the music hit incredibly hard. There are many moments where you will see a room or a courtyard or some kind of opening and pause, knowing that something lurks ahead. You slowly step forward, or sprint excitedly ahead like a madman, and then the music hits. A fight I mentioned earlier that is one of my absolute favorites is the Gaping Dragon. Not only is it one of my favorites aesthetically, it also has one of my favorite cutscenes and themes of the game. As you descend into its lair, the dragon suddenly climbs up over a cliff at the edge of its arena in all its gruesome glory. It roars at you ferociously and charges and the fight immediately begins, the opening panic of its theme sounds like a horror film. It gets your heart pounding immediately. Another boss theme that is similar to Gaping Dragon in scope is that of the Ornstein and Smough fight. This fight has you paired against tag-teaming enemies, and is a fight you are sure to bounce off your first couple times. This is a fight with an epic theme, packed full of harmonizing horns that crescendo higher with every pound of the drums. It’s one of those tracks that makes the fight feel even more awesome than it already is. My last highlighted track for the first game is one that requires a bit more exposition to fully understand how masterful it is. 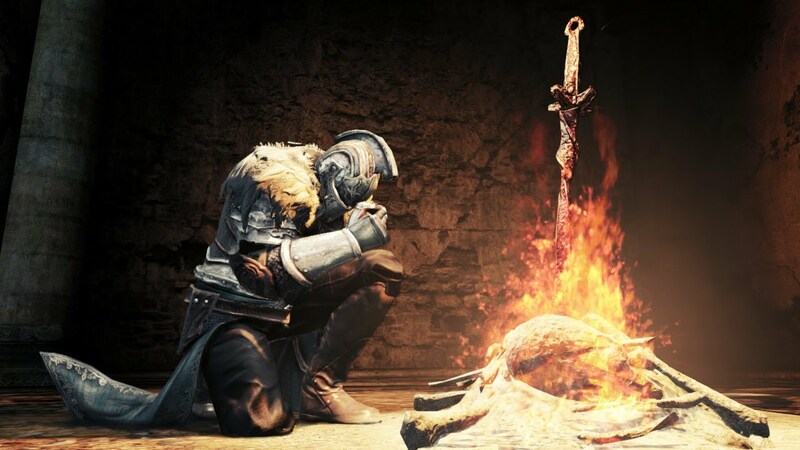 The end boss of the game, Gwyn, Lord of Cinder, is a character at this point you have heard a lot about. The opening cutscene is the first place he is seen, as it tells you about him slaughtering the dragons he is at war with. He is a strong and mighty being, heaving bolts of lightning at these huge beasts and taking them down with ease. Gwyn is a god. He brought about the age of fire in which life flourished for so long. But now the first flame is dying, and with it dies the world. Gwyn has retreated to the Kiln of the First Flame, where he attempts to guard the fading flame as long as he can, to keep his age of fire alive. The whole game you hear of Gwyn, the Lord of Sunlight, and his conquests. You see his castle, magnificent in stature and grand. You fight some of his loyal subjects, fierce warriors who are sure to kill you at least once upon your first encounter. And then, you find Gwyn. When you enter The Kiln of the First Flame, a slow piano melody begins to play. The keys plink along in discordant dread, a haunting and absolutely beautiful theme. And you see Gwyn. He is no longer the Great Lord you saw him as before. He is not what he is described as. He is a husk of a man, turned hollow by the plague that has swept the land. He lashes out at you ferociously and without technique. If you are good at parrying, the fight can be over in less than a minute. Gwyn has fallen to the darkness, the thing he feared the most and locked himself away to hide from. His theme is played on only white keys on the piano. Sakuraba wonderfully arranged even his theme to avoid the dark. The fight itself with Gwyn is incredibly anti-climatic after some of the amazing duels you’ve had beforehand, but it is not the fight itself that makes this beautiful. The lore implications of everything surrounding Gwyn here, and how somber his theme is make it one of the most incredible moments of the series, and gaming in general in my opinion. Dark Souls II was an obvious choice after the success and acclaim of the first. People sat tentatively on the edge of their seats awaiting the next move by From Software. Unfortunately, a lot of people were let down by Dark Souls II. It was a much more linear entry that didn’t see you traversing the overworld in the same way, and the boss designs seemed without heart and effort at times. Sadly, this also seemed to apply to the soundtrack as well. Sakuraba was not able to fully replicate the magic of the first entry in the trilogy. That being said, I don’t personally dislike any of the soundtracks we discuss here aside from the Demon of Song. It is just a commonly held ground that the soundtrack for the sequel was not up to scratch with the grandiose tone of the first. The boss fights feel like epic songs that happen to play during boss encounters as opposed to themes that fit the boss, area, and mood. While all these things are certainly true, the songs are still good and sound like Dark Souls. The somber keys, the epic choral vocals and chants, the jarring crescendos, it’s all still present. Sakuraba was also primarily responsible for this soundtrack. He was assisted by Yuka Kitamura for this game. Dark Souls II follows the same conventions as the first. You find yourself in a desolate and dying world and are again tasked with going on a grand quest to vanquish the Great Lords and use the power of their souls to restart the current cycle or end it for good. Your protagonist is destined to become the next monarch, and you are faced with impossible odds before that can happen. The overworld is bleak and barren, and devoid of music aside from boss encounters and hub areas. The main hub in II, Majula, actually has one of my top tracks in the series. The Majula theme features piercing synth notes and haunting strings. A subtle background noise effect that sounds like a gust of wind over the ocean waves permeates the opening notes of the theme as the discordant sounds paint a depressing scene in this small town. And yet, the air of caution and anxiety that is so rapturous in boss themes is missing from this. While it is a melancholic track, it fits in the hub because of the calm undertones to it. The first time you step out of the dark starting area of Things Betwixt and into the sunlight of Majula and those first few notes play, it is striking. This theme has stuck with me for a long time now, and standing in the middle of Majula with the handful of ragtag NPCs you find through the world makes me incredibly happy; a feeling hard to find in Dark Souls. Majula has a feeling of home that is lost on Firelink Shrine, and the theme for the town makes that feeling come full circle. The Last Giant is one of the first bosses you will face, and if you go the ‘proper’ way, will be your very first in Dark Souls II. He is, as his name implies, the very last member of his race. You encounter him in the Forest of Fallen Giants, an ancient battlefield filled with ramshackle corpses reanimated by the curse of the land and the petrified corpses of lumbering giants. At the end of the level, you descend an elevator and find The Last Giant, impaled on a stake and left in a small underground cavern. When he sees you, he goes into a rage and tears himself free of the stake. Much like the Gaping Dragon, he roars and charges at you and the battle begins. The theme for this fight is one of my favorites for the second game, and one I feel is most reminiscent of the first. It has the epic chanting, the pounding drums, and, my favorite, the frantic string arrangements that create a sense of panic. The giant is immense and you fight him in a relatively tight cavern which he can leap completely across with ease. Couple that with the fact that he tears one of his own arms off part way through the fight to reach you better, and it can be an intimidating fight your first time around. This piece of music elevates that panic as so many tracks in one did time and time again. The Ancient Dragon is not only one of the most badass-looking creatures across the whole series, but he is also lucky enough to have probably the coolest boss theme in the main game of Dark Souls II. The track sounds like something from an action movie, with a full orchestra bringing an epic energy to the fight. It has chanting vocals through the whole thing, with tons of incorporated percussion, strings, and horns creating a really eclectic work for this game. And it’s a good thing this boss has good music, because this is one of the longest fights you’ll endure in the entire series if you’re brave enough to initiate it. The Demon of Song is one boss that I feel a compulsion to talk about for a lot of reasons. The Shrine of Amana is one of the only areas in the trilogy that has music throughout it. There are Maidens of Song through the level that sing a song eternally, to keep the Demon of Song at bay. When you encounter this boss… it is interesting to say the least. It is a pretty easy fight, in a wide open arena with tons of room to move. The boss is a giant frog monster with a mummified face that it hides behind foreskin-like impenetrable flaps that cover its face and put it in a defensive stance. It’s a gross-looking boss, and feels really bad in the game. Its theme is one of the most diverse as well, albeit in an a bad way adjacent to everything else about the boss. The vocals in it feel unnerving in a way unlike anything else in the game, and I just want them to stop so I can get out of the hellhole that is the Shrine of Amana every time I reach this point. There are some boss themes in this game that simply don’t deliver at all. The Flexile Sentry is a great example of this. The low, baritone piano drones with little to no variation and there is no grand crescendo in this theme or anything to give the sense of trouble that makes so many of these great tracks to fight a boss to. Scorpioness Najka is another similar one to this. It has more going on than the Flexile Sentry, but it sounds like it could be more of a menu theme than the epic tracks accustomed to boss fights. I am unsure what it is about this soundtrack and the process creating it that makes it stray so far from the first game at times, but it resulted in Yuka Kitamura taking over the lead spot on music for the next From Software title. Bloodborne is a very special game, next to many other such games. Driven by the approach of the Dark Souls series it manages to conjure a nightmarish horror akin to none before. The scenery of the game is basically a mix of Victorian Gothic architecture found in the Czech Republic and Romania, and surreal landscapes drawn from H.P. Lovecraft’s works. It is incredibly complex and executed in a fastidious manner and aspect which is further emphasized by the accompanying music. The soundtrack makes no exception, being written and executed with the utmost dedication to the most authentic delivery in terms of experience. It shouldn’t require noting, but the production value is absolutely stunning, in equal parts for the actual music and all the other sound effects, this is probably the closest to flawless that’s possible. The soundtrack has a veritable host of people who helped bring it to life. Among the many, it was composed byRyan Amon, Tsukasa Saitoh, Cris Velasco, Yuka Kitamura, Michael Wandmacher, and Nobuyoshi Suzuki. Kitamura was the primary composer on the project, taking the reins for From Software after lending his expertise for Dark Souls II. It was arranged by Penka Kouneva and Jim Fowler. The performance was done by a 65-piece orchestra and a 32-piece choir named Metro Voices. Spanning nearly 110 minutes, the soundtrack focuses mostly on providing dramatic effect during boss fights, otherwise music is scarce. There are a couple of areas where there’s some music, like in the Dream (“Hunter’s Dream”) where the player is greeted with a serene song and after passing a certain level of insight the track changes (“Moonlit Melody”). Then, besides the prologue (“The Night Unfurls”) and the menu (“Omen”) tracks, we have musical accompaniments only in the areas of Hypogean Gaol (“Hail the Nightmare”) and Upper Cathedral Ward (“Soothing Hymn”). However, the scarcity of music doesn’t make the game any less engaging. The sound effects are on par with everything else; that is, they are excellent. From the way all the ambiance pans around the perspective of the player to the layout of the sound stage all the way down to the meticulous level of detail, we’re greeted with an insane level of immersion that adds a whole new dimension to the already horror inducing atmosphere. It is also somewhat of a necessity to hear all the other sounds – the ambient, the creeps, and whatnot – because at any given moment, you are just inches away from getting lynched. Having this fair amount of silence and what is basically field recordings definitely has a charm of its own. The boss tracks are indeed, without a question, the highlights of the sonic works that have come to play in this game. Each track offers a distinct edge just as each boss has a unique appearance and style of combat. The tracks not only give a great sense of suspense but also feel tailored somehow to the entire scene that is unfolding. The boss tracks are easily distinguished (not only because they make up most of the OST) because their titles are almost always the names of said bosses. Among these some of the most outstanding would be: “The Hunter”, “The One Reborn”, “Queen of Vilebloods”, “Ebrietas, Daughter of the Cosmos” and “Rom, the Vacuous Spider”. The individual tracks on average don’t pass the four-minute mark, which is rather surprising as it doesn’t feel like that at all while playing. The way they loop is just another by-product of the mastery involved. If taken away from the context of the game, say if you would treat this collection of songs as an orchestral album, a lot of the tracks lose some of their charm. Since the explored moods are all bent on stark darkness, extreme bleakness, sheer terror and a surreal expansiveness and how all of that works so well with the scenery, plot and other elements. It’s like taking a vital part away from a finely tuned mechanism. It’s easy to fall prey to the thought that the songs start sounding redundant when playing the OST without the game, because the overall mood doesn’t really change and also because of the subtlety of the dynamic that’s present. It’s hard to pin down exactly what style of orchestral music this is, but there are certainly a lot of tinges and influences spread across. They definitely weren’t lying when they said ‘original soundtrack’. There is a vague resemblance to the Star Wars soundtracks in terms of occupied space and depth of atmosphere, something that I’d say is rooted in the works of the New Russian School/Mighty Handful. The vocal part, which is most of the time choir driven, borrows a fair deal from classic Gregorian chants and just a pinch from Bulgarian folk music. I’d say there’s also traces of Carl Orff here and there. Altogether, even if there are similarities, the whole package comes across as vibrant, unique, and unsettling in ways orchestral music rarely (or ever) does. Everything about this game is yet another solidifying testament to the respect for craft and aspiring for virtue that is the hallmark of everything artistic that emerges from Japan. The eerie aural delight that travels alongside this twisted game is something to bask in. After the one-off Bloodborne, series creator Hidetaka Miyazaki turned his attention back to Dark Souls. After II failed to follow the same narrative and seemed to lack the TLC given to designing the first game, Miyazaki took personal care to make this new game something for fans to really enjoy. This game is a direct sequel to Dark Souls, while Dark Souls II was kind of its own thing in a fractured universe. Kitamura was the primary composer once more, but Motoi Sakuraba contributed a lot of tracks as well. Tsukasa Saitoh and Nobuyoshi Suzuki are the two other composers who are credited for composition rights in this installment. Dark Souls III is the final installment in the series, and its final DLC, The Ringed City, ends the cycle that began in Dark Souls. The menu and prologue themes are very nice for this one, and definitely follow suit of the arrangements in the first two. They are brooding, ominous, and slowly churning tracks. The hub theme for Firelink Shrine, which makes its return, is concurrent with hub songs for the most part. I personally think this game has the weakest hub soundtrack. None of them come close to Majula, but both Firelink tunes come neck and neck, and I think the first one edges it out. Some of the boss themes in this game are great, and I feel this team captured the things they needed to in order to get back to what made the first game so great for the most part. There are a couple of tracks that I feel are still a bit boring, and Kitamura’s tracks in particular seem to lack variation oftentimes. One track that I feel hits the mark immensely is “Vordt of the Boreal Valley”, the first in-game track you encounter that is done by Sakuraba. It starts off good, and is reminiscent of his work from the first game, but might not be anything special on first listen. However, partway through this fight there is a change to the song. When you inflict enough damage on Vordt, he begins to radiate cold that damages you when you are near him and picks up speed immensely. The fight takes a frantic turn at this point that often finds you on the defensive, and there is a huge change of tempo in the theme at this point. It feels so great, and is one of my favorite early moments. The very next boss, and his very next contribution, is the “Cursed Rotted Greatwood”. It is one of the tracks that fails to deliver to me. There is very little variation in it, and it’s kind of strange to follow up one of the best boss fights in the game with one of the worst. This is once again followed up with one of the most interesting in the game. Though a bit different than some other themes, the Crystal Sages fight has another great theme. The baroque keys from the first game are present with haunting strings and ominous notes throughout. There is a huge crescendo in the middle of the fight that is immense. Shortly after this fight is another boring theme in the Deacons of the Deep battle. As with its predecessor, even though some of the music fits well, there are moments where it does lack. Even with some lack of variation at times in the themes, this game has some of the best boss fights in any game ever created. Let’s talk about a couple of the wonderful tracks that accompany those ones instead of the negatives. If there was someone who had never seen a Dark Souls game and I wanted to show them one thing to interest them; it would be the Abyss Watchers fight. The opening cutscene is one of the coolest things ever. The way the fight goes down and the sudden shift it undertakes partway through make this one of the best fights in the series aesthetically. The music fits it well. The track is brooding and somber in the beginning, mainly layered vocals with a violin accompanying it and other strings in the background that ebb and flow in the layering. It’s not one of the most grand or exciting in the series, but this is one of the only fights that is physically beautiful enough to be enhanced by an equally beautiful piece of music instead of the epic themes that usually fit. We have talked exclusively about main game tracks to this point through all three Dark Souls games and even Bloodborne. That seems crazy to me given how awesome all the DLC content for these games is. Since we have made it this far, I don’t want to go too deep into it, but there is one fight in the trilogy that you absolutely cannot overlook from the DLC. Slave Knight Gael. If you have played this game, that’s a name that will make your blood pump a little bit faster and bring a wicked grin to your face. I’m just gonna straight up say it: Gael is the very best fight in this entire series filled with great fights. He is probably my favorite boss of all time. Every single thing about this fight is amazing. From the lore, to the music, to the fight. His animations are amazing. He is relentless and looks cool as hell chasing you down to kill you. He is the Dark Soul. And he is the last fight in this series, before it all comes to an end. His theme is nine minutes long, and just keeps getting more and more epic as time goes on. There are few words I can say about it that will not sound redundant after discussing this entire soundtrack, and thus will not do it justice. But please, if you read this and aren’t listening to any of the linked tracks, take the time to actually listen to this one. It’s such an epic song and deserves a full listen. Yuka Kitamura did an absolutely fantastic job on this track in particular, and this track shows me that he deserved primary composition rights on this game. The last track I want to highlight is for a special reason. Backing off the DLC, we return to the main fight of the base game. The Soul of Cinder is an amalgamation of all the previous Lords of Cinder to exist, fighting as individual souls inside one vessel. As such, the beginning of this fight sees it implementing numerous weapons and movesets to keep you on your toes. The theme is epic and frenzied, with the telltale horns, percussion, and strings of boss battles before. It calls back to many boss fights with its epic scale, but presently doesn’t feel like much of a final fight. And then at a point in the fight, you enter the second phase. This is something you are used to at this point in the game. Plenty of bosses have different phases, and you should surely expect the final boss to. And then you hear it, those three piano notes. It is the beginning of Gwyn’s theme, and suddenly the bosses moveset changes to resembles Gwyn’s. That is because you suddenly find yourself confronting your old foe after all this time. Of all the souls in the vessel, the original Lord of Cinder takes center-stage when together they cannot topple you. Gwyn has one final chance to stop the Chosen Undead, to stop the flame from being snuffed, and to keep this world from ending and starting over. It is a selfish battle on his end, but one he fights to the very end. Hearing his theme again, and seeing him once more in a sense after all this time is chilling. From Software did something really stellar with the music for these games. There is little like it that functions so well on an epic scale, and few other games can get my heart pounding by sound design alone. You have come through so much, Chosen Undead. Thank you for enduring this love letter to the music of Dark Souls! If you’re curious, I have personally put over 100 hours of gameplay into every game covered, and have put dozens of hours into lore-diving as well. You can find me sun bro-ing it up on the PS4, getting summoned in to crush bosses with a Demon’s Great Hammer and Sunlight Spears. Now praise the sun, for it frees you from my grasp for now. You can take the journey into these worlds yourself, with Dark Souls and Dark Souls II originally on Playstation 3 or Xbox 360 and PC. The first two games have been remastered, however, and join Dark Souls III on Playstation 4, Xbox One, and PC. Bloodborne is a Sony exclusive that can only be played on the PS4. Previous PostGod Is An Astronaut Announce "Epitaph North American Tour 2019"